International didn't just bring it's super shredder semi, the International LoneStar to the show. 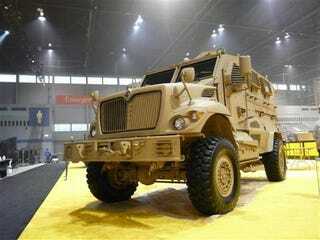 They also brought the US Military's latest wheeled transport, the International MaxxPro. The imposing vehicle is basically a purpose-built mobile bomb shelter, capable of taking a hit from any direction, as well as fording bodies of water as deep as 36 inches, just for the hell of it. When we opened the door—or more precisely, tried to open the door—we had to abandon all all our stuff and put our weight behind the effort. The thick armor plated doors were almost as heavy as the ones on an old Mark VIII. While the Humvee is impressive in its general-purpose skills, this thing is just a plain beast. We want a test drive of the take home version. Any vehicle with gun portals gets an "A" in our book. INTERNATIONAL MaxxPrO™ MaxxPro,™ the International® Mine Protected Vehicle. Built to withstand ballistic arms fire, mineblasts, IEDs, and nuclear, biological, and chemical environments that threaten the safety of its crew. Armoring flexibility allows upgrades to achieve the correct level of protection the mission requires. And International's proven severe service platform means quality, durability and reliability are on the battlefield. The International MPV. Miles Ahead. In protection and progress. Ground Clearance (Center of Vehicle): 14"
Ground Clearance (Differential Clearance): 11"